A turn of the knob. That is all it took for everything to stop. The doctor turned the oxygen cylinder off since the last breath had been struggled with. The sickening clicks of the knob stopped the bubbles, stopped the familiar laboured gushing of warm air out of the pipe, stopped our lives, altered all our plans and put an end to belief in a higher power . Whispers started asking us to keep the faith and be strong. How does one keep the faith when the very ground we stand on gives away? How does one be strong when the last iota of hope leaves your body? There is no strength and faith must have turned to ashes by now. The tree outside is laden with lemons. The best crop ever. It is morning and I can almost hear the rustle of the leaves as he picks up his long bamboo stick to pluck the ripe ones. If I strain my ears hard enough I can hear him berate mum for not having the bitter concoction he made of natural medicines. She is diabetic and he is worried about her. Was. I try hard to keep all memories intact. His smile, his voice, his mumble when you ask him how the dessert was, his pride when he’d see the boys bring home certificates, his annoyance at me for scolding them, mum’s fond stories of him telling everyone how smart I am. The list goes on but the wisps of memories get clouded by the vision of him lying there, trying to hold on to what was the last breath. Last night we checked on him. The pyre glowing and slowly burning to ashes the limited time I had with him. I saw his smile on seeing my thesis rise up, I felt the warmth of his resolve to push me to study more. His siding with me whenever I argued with my husband, his son, and the sheer joy on his face when the boys hugged him – all being licked by flames. The morning after started with the expectation of the familiar question, ‘Bunty is up?’ There was none. He ought to be outside in the lawn by now, tending to his plants. He is not. So many people around, yet we all look for him. He should be here. Every corner of the house has him in it. A neatly flattened card made by his eldest grandkid under his mattress, the artwork by the youngest under the cushion, the countless pictures on the wall, the favourite shirts- all look uncertain, a bit lost. A fortnight ago, dread turned into hope. Hope into despair. Despair into grief. But underlying it all was a numbness. A numbness that clutched the heart and tied the soul down. It still grips us in its damp, vicious clutches. I think I should befriend it for it seems to be making our lives its home. We had plans. Small ones. Grand ones. All revolving around our four folks. The boys always knew that they had four cape-wearing, wand-wielding super grandparents. We have three now and the superhero count is down too. The plans seem to be laughing hard at us. People ask his age. 76. Some of them nod as if certifying that 76 is the age to go. Is it? When does one stop being a dream catcher for his grandkids, a pillar for his kids, a shoulder for his wife and become too old to be? Is there an expiry date? For us, he was young. He wanted to live. And he worked hard to keep fit. Yet here we are – answering the question again and again and wanting to scream, ‘it wasn’t his time’ every time. The boys grew up yesterday. One held his grandmum while the other helped his grandpa undertake the last journey. The little boy who sat on his grandpa’s shoulder had now his shoulders burdened with weight of loss. He would have disapproved. For him, the six footer will always be a toddler who needed help with carrying everything. The boys will carry him in their hearts for ever. Late last night, the phone screen lit up. It was the older one’s message. ‘I miss dada.’ Silence followed. There isn’t much I can say or do except share his tears. Empty words. I know he is trying to fight tears, trying to free his soul from the numb, cold grief. I know he is failing like all of us. Does it get better? The aching muscles, the frowns, the tear-drained eyes, the denying mind – all ask. Does it? The pictures on the walls say that it doesn’t. It never will. The diwali lights will never be inspected. We will never be ordered to get icecream for the boys. No one is going to read out what I write to people who are probably not interested. No one will make them listen. No one will tell us that we need not worry about anything. No one will pluck those lemons. 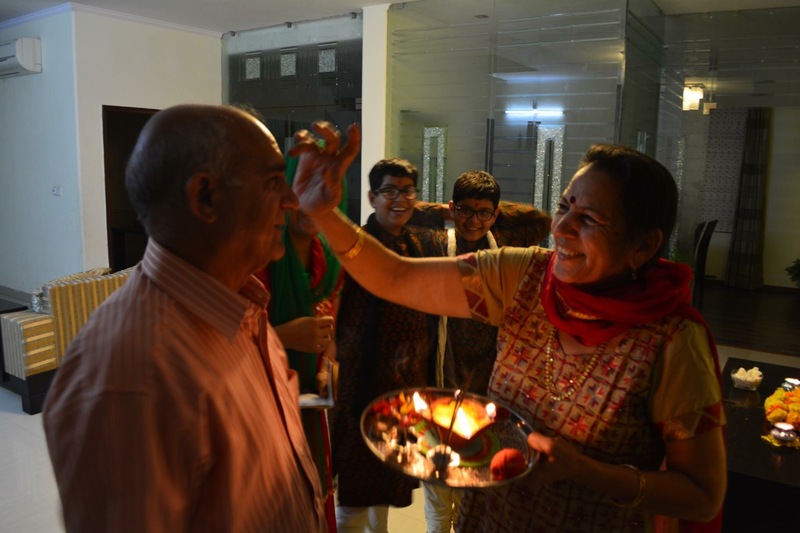 This entry was posted in Beyond Parenthood and tagged dealing with death, dealing with loss, death, loss, loss of a parent by Tanu shree singh. Bookmark the permalink. Don’t want to say much as nothing can fill the void. Take care, Tanu! I’m so very sorry, my dear, far away, friend. This brought back vivid memories of when I lost my Daddy, all those many years ago. He never got to know his grandchildren……….all but one, were born after Daddy left us. I would hope he is as proud of them, as I think he would be…….like your dad was proud of his. Hang on……. It was heart breaking to see my husband and the boys grow up in that one moment. His loss is far greater than mine but to see them and my Mum in law broken, crushes me. Don’t know you personally but your story echoes what we went through 8 years back with my dad. Leaving the hospital at night – him still breathing and we having agreed with the doctors that no more medicines to keep him on the ventilator – having said our goodbyes, the Ganga jal and tulsi touched to his lips and knowing very well that – that night there will be a call to tell us he is no more. The void is huge. I can only say time heals – somewhat… we have stayed strong because of his memories and the values he instilled in us..
A big hug, Rashmi. And thanks for your prayers. Bhabhi, choosing the write words won’t lessen the tragic loss of losing one of the most loving and endearing person I knew. No matter what the situation, Tauji always smiled…he gave us hope when dad was operated.. ….he left us too soon… the pain is hard and it is going to stay…time is a healer they say, but for me the void and pain remains forever….for us you are a pillar of strength and at this moment someone who will tk care of the entire family….he is watching you from up there.. so stay strong..and you know we all stand by you…. I am speechless . So many memories come crowding to my mind . Life will never be the same without Chacha. Take care, all of you ! I do not know you yet your words strike a chord in my heart. Having recently lost two people so dear to me, I wonder at the resilience unknown to us that keeps us going. A moment stands still when the dear one is gone – yet we move on, we must. Wishing you strength and courage. Hugs. Strength and prayers to you too. Tanu, all I want to say is the loss of a parent can never be replaced. Having lost both my parents, the void left behind is irreplaceable. Take care. God be with you and your family in this time of grief. Thank you. You’d be in my prayers too.